No flower says Christmas more the beautiful and colorful poinsettia. Also known as the Christmas Star and Christmas Flower, it's said that poinsettias’ association with Christmas comes from a Mexican legend. The story goes that a child, with no means for a grander gift, gathered humble weeds from the side of the road to place at the church alter on Christmas Eve. As the congregation witnessed a Christmas miracle, the weeds turned into brilliant red and green flowers. While considered by the ancient Aztecs to be symbols of purity, in today's language of flowers, red, white or pink poinsettias, the December birth flower, symbolize good cheer and success and are said to bring wishes of mirth and celebration. It may seem strange due to their holiday connotations, but poinsettias are actually tropical plants. 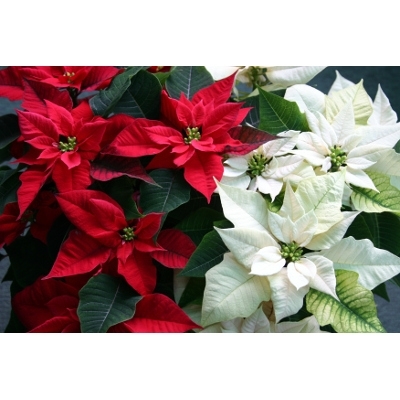 Provide lots of sunlight and make sure to water the poinsettia whenever the surface of the soil feels dry. Give the plant a good watering, but don’t flood or soak it – gravel in the bottom of the pot will help keep the roots dry. If your home is dry during the winter months, a humidifier or plant mister can help your plant stay hydrated.